Cloud-based computing offers advantages in speed and cost, and desktop software is adapting to leverage the benefits. It seems like just yesterday we had dial-up internet connections using 56k modems. It is amazing to observe how technology has evolved and how much our lives depend on being connected. That evolution is driving fundamental changes for geospatial professionals. Some of these changes include an increased use of cloud-based technologies coupled with growing power and functionality of field and office software. These advances are blurring the line between field, cloud, and office operations. To make an attempt at providing the answers, we need to understand the evolving role and capabilities of software on the desktop and in the cloud and how connectivity is transforming the work of geospatial professionals. 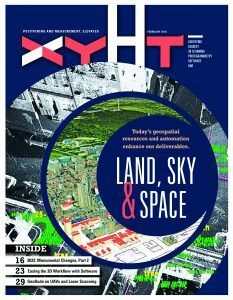 Desktop software has traditionally handled the heavy lifting in geospatial data processing. Applications such as GNSS post-processing, image processing, point-cloud registration, and terrain modeling have long occupied the desktop platform. Some of these operations require heavy human interaction while others are more straightforward to execute. The latter, especially the “set it and forget it” batch operations, are prime candidates for automated processing. And in automated processing, computations can take place on the office computer or on a remote server. Cloud-based processing for geospatial data has been around for a while. One example is the Online Positioning User Service (OPUS) operated by the U.S. National Geodetic Survey for processing raw GNSS data. Users upload a RINEX file and receive results in minutes. Other cloud-processing services process UAS and laser-scanning data to create orthophotos or registered point clouds. These applications illustrate a key point: High-performance software is not going away, but the location of the software executable files and the way software is developed is going to change. As the capabilities and capacities of field sensors continue to increase, computations will be more complex and will require greater computing power. At first glance, cloud-based processing seems to provide the same services as desktop software: it hosts the software and enables automated, hands-off processing. It also provides data storage and shared deliverables among users and their clients. While cloud processing offers some significant advantages, it may not be an ideal solution for everyone. Entities such as military, power generation, and critical infrastructure require in-house computing for security and confidentiality. In many regions, limited internet connectivity restricts operators to local computers and storage. Many of the people who use the software I help develop are also field practitioners – in surveying and construction – and are well aware that in many instances “the cloud” is not always accessible. And in some countries, national government regulations place restrictions on the use of geographic data stored on non-governmental servers. In addition, a potential downside to using cloud-based services with huge amounts of data is that the time it takes to upload the data may offset the benefits of faster processing (e.g., for gigabytes of point-cloud data it may take a whole day just to upload a project). It all depends on what the project goals are. As a software person I understand the need to support needs of both on- and offline users. Organizations that, for whatever reasons, are not connected to the internet must have access to the same functionality as those who are connected. 1) It can lead to reduced capital expenditures related to traditional office computing purchases. Instead of investing in high-performance office computers, organizations can use lower power (and lower cost) office hardware and even work on tablets and smartphone devices to perform most common tasks. Front-end expenses of purchasing software licenses are also reduced. The software-as-a-service (SAAS) or subscription models enable organizations to pay for only what they use and to allocate software costs to a specific project. 2) It can lead to reduced processing time. Cloud-based services use remote servers that can complete complex computations faster than most desktop computers. Multithreaded algorithms can be deployed on multiple computers to provide cloud-based distributed computingÑan attractive approach to handling large, complex processing. A UAS dataset that takes hours to process in the office can be completed in a fraction of time by leveraging the shared network architecture of remote servers. The faster turnaround shortens delivery time and frees technicians to work on other tasks while the process is running. 3) The third advantage is driven by the increasing volume of data produced by today’s field technologies (e.g. scanning and imaging). For large datasets, cloud storage is an easy and cost-efficient alternative to setting up large-capacity in-house servers. Cloud-based storage provides physical security of the hardware, automatic backups, and strong defense against unauthorized access while allowing organizations to maintain ownership and tight control over their data. The effort that companies like Amazon and Google put in to data protection and security is impressive. When you think about the number of incidents of operating system crashes or your hard drive failures, online storage of essential data becomes a bargain. 4) Cloud-resident software removes the need to install and deploy software locally. This reduces IT costs and ensures that the entire organization is running the same software and version. Time and disruption related to installing software updates can be greatly reduced. The cloud-deployed software places the maintenance onus on software manufacturers. They can provide users with the most up-to-date software and issue service packs as needed. 5) Cloud-based services excel at project collaboration through data storage, sharing, and visualization among field, office, client, and downstream users. Geospatial professionals can use online viewers and controlled access to enable shareholders to see information without compromising the integrity (and security) of the raw data and computations. Many online viewers provide tools that enable non-geospatial users to make basic measurements, extract attributes, and generate reports. The cloud enables one dataset to support multiple disciplines with varying needs. Data files stored on remote servers can be accessed using desktop software like TBC; online storage provides secure, cost-effective data management. An increasing number of geospatial applications are leveraging the benefits of cloud computing. This movement is driven by the need for multiple users and disciplines to access and use the same data. The change is well underway – the sooner we embrace this trend in our organizations, the earlier we will see the benefit and return on investment in making the transition. One important example of this trend is the GIS community, which leverages cloud processing to handle multiple types of data and presents it to stakeholders in the public and private sectors. The information is easily accessible and presented in ways suitable for technical and professional users as well as the public via, e.g., ArcGIS Server. Cloud-based systems allow surveyors and GIS professionals to collaborate directly on file and enterprise geodatabases. The technologies help to mitigate issues related to data transfers and import/export conversions. Many segments in the architectural, engineering, and construction industry are also embracing cloud computing. Planning, design, project management, and building information modeling (BIM) can all benefit from using common platforms to manage data and design processes under one dataset. On the jobsite, multiple trades can remotely access project data for layout, inspections, and construction documentation via online collaboration environments such as Trimble Connect. Surveyors benefit from real-time GNSS networks that use cloud computing for data-acquisition and processing to develop and deliver correction data. Correction services such as Trimble CenterPoint RTX enable GNSS field crews to achieve centimeter accuracy. CenterPoint RTX enables GNSS users to achieve real-time centimeter accuracy nearly anywhere in the worldwide through corrections via satellite and internet. The advances in cloud computing is good news, but what does this mean for the traditional desktop office software? It’s not going away, but it will evolve in several directions. In one scenario, office software will be used to prepare data for automated processing by remote servers. This batch process can be illustrated with, for example, Trimble Business Center software (TBC) and the Trimble CenterPoint RTX Post Processing service. In this case, TBC prepares the data and sends it to CenterPoint RTX or OPUS servers for post-processing. When the results come back, TBC adds the computed points with their metadata to its database. A second approach uses the desktop computer as a terminal for cloud-resident software, enabling users to interact with the software and data. In this case, the software is completely online; there are no (or very limited) locally deployed executables. For instance, the MySketchUp.com solution provides powerful 3D design and modeling functionality on desktop computers running nothing more than a web browser. It’s a good solution for users who need to verify designs and ideas or tweak individual parameters. This can be done on the go using a tablet or a smartphone device. Collaborative design software can be shared among multiple users. Using the online service Open Street Map with TBC adds context and easy access to mobile mapping data. The important point is that the cloud and desktop are not an either/or situation. From my standpoint of focusing on quality, productivity, and security, there are benefits to both. Ideally the workflow drives where the technology resides – the processes are designed to leverage the best available option. Perhaps the optimal solution is a hybrid that provides tight, local-user interaction while offloading the “heavy” data to remote processors. The links between cloud and desktop can be very smooth. For example, TBC can use web mapping services to automatically load and update georeferenced background maps. Rather than downloading static map data, WMS continually loads data as you pan across a project. My employer, Trimble, has a goal to leverage cloud and desktop technologies to transform work processes and maximize benefits to users and their clients. A big part of this comes by enabling geospatial professionals to make informed decisions about their software; that includes when and how to work connected, or disconnected. Ultimately, the choice lies with the user.